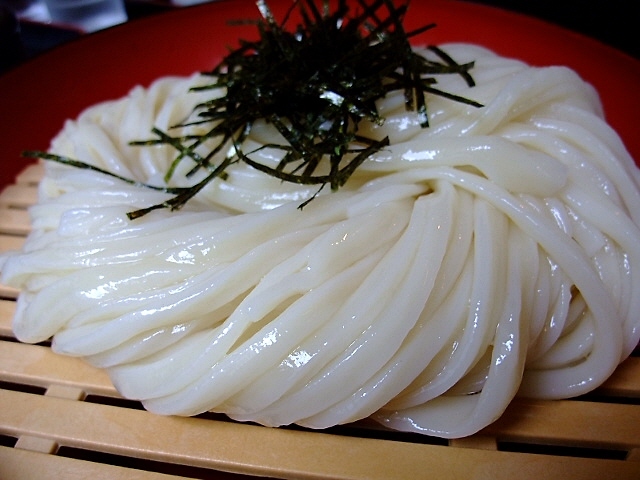 Sushi and Zaru-Udon.What do you want to eat in Japan? 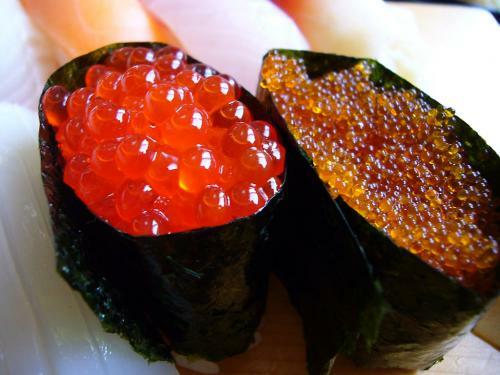 Japanese dishes are not limited only to Sushi and Tempura. Eating is part of the fun of traveling in Japan. Be prepared to be shocked by how delicious the food prepared with the original recipes is!! Find what you want to eat in Japan! Do you want to make some Japanese dishes even after you return back home? Enjoy some of our recipes!! Find yours from millions of hot springs in Japan! 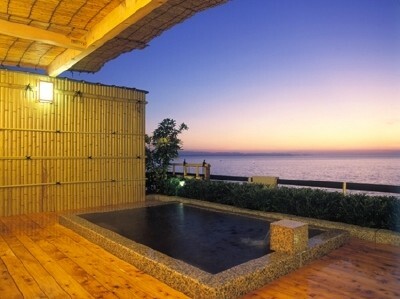 Thousands of millions of onsen (hot springs) are scattered across Japan. 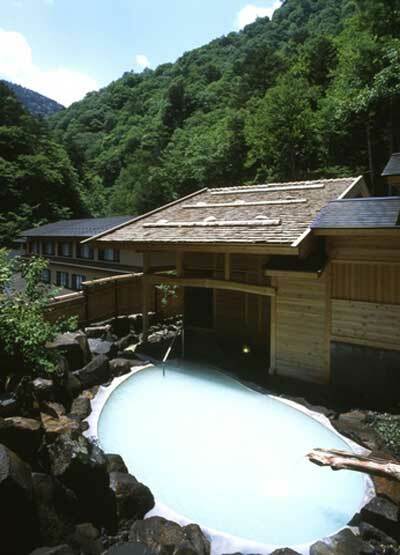 Real onsens contain minerals and are bubbling from the ground. Your skin will become smooth like a baby’s, if you find the spring that contains good minerals! Relax and feel like you are in heaven soaking in the hot water. Just like the Japanese do!! Even if that’s all you do, your time in Japan won't be enough to try all of them!! 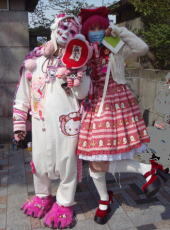 Do you want to see these people in person in Japan as you might have seen them in a magazine before? Go to Harajuku in Tokyo! You will find many people wearing VERY fashionable or VERY interesting clothes. You will also see people dancing in the streets. Why don't you experience a tea ceremony, Japanese art of flower arrangements, Japanese pottery or Japanese Calligraphy while you are in Japan? You should check out Kabuki, Japanese gardens, Sumo, Anime, Irezumi (Japanese tattoo), Kimono and Japanese seasonal events such as cherry blossom parties in spring and enjoy a stroll through the beautifully colored “turning leafs” in autumn. Japan's UNESCO World Heritage Sites are listed below. Do you want to check out all of these? Several volcanic ranges running through the country have given Japan a great deal of variety in its topographical features. Its rivers are short and fast-flowing and form deep gorges in the mountainous areas. All of the major islands have highly irregular coast lines. Nearly 70% of Japan's land area is mountainous. Learn how to be a Ninja!! 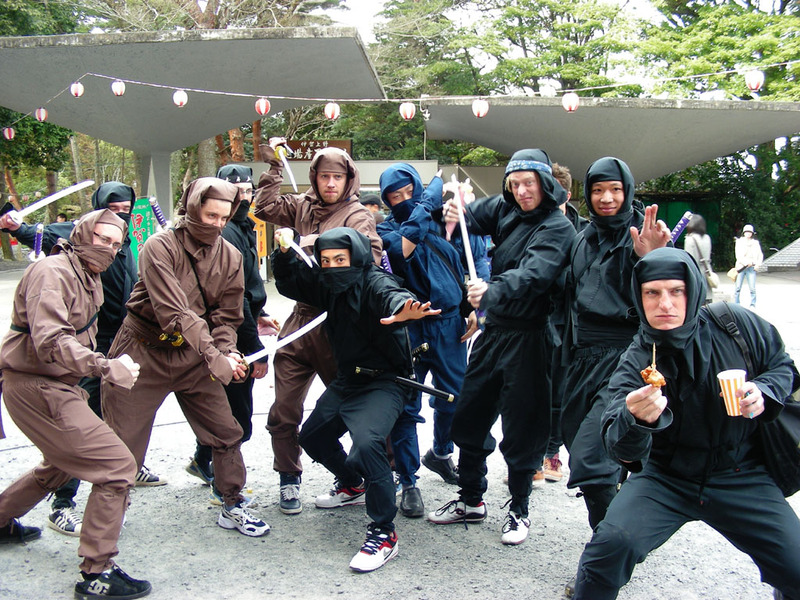 Get the information to be a Ninja!! You even might become a Samurai warrior. The Japanese archipelago is stretching about 3,500 kilometers in a northeast-to-southwest direction and consists of four main islands (Honshu, Shikoku, Kyushu and Hokkaido) and more than 6000 smaller islands. Several volcanic ranges running through the country have given Japan a great deal of variety in its topographical features. Its rivers are short and fast-flowing and form deep gorges in the mountainous areas. All of the major islands have highly irregular coast lines. 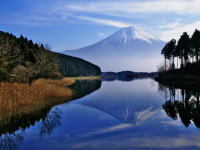 Nearly 70% of Japan's land area is mountainous. As of 2008 Japan has a total population of about 127 million. The National Institute of Population and Social Security Research predicts that the population will gradually decrease to 100 million by 2050, when it will have fallen to the rank of the world's fifteenth largest, and continue its decline to half its current size by 2100. Unfortunately, Japan's population is also expected to age at the fastest rate in the world. The Japanese climate differs greatly from region to region. Although this is largely due to the country's north-south length of 3,000km (1,860 miles) which puts one of its ends in the sub-frigid zone and the other in the sub-tropic zone, a complex topography and the influence of ocean currents are also important factors. 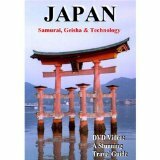 Most of Japan does, however, enjoy a temperate, oceanic type of climate with four distinct seasons. Ranges of rugged mountains running nearly the full length of the country give the Pacific and Sea of Japan sides of the islands vastly differing climatic patterns. On the Pacific side, the summers are hot and humid with prevailing seasonal winds from the southeast. The winters are dry and marked by many clear days. On the Sea of Japan side, northwesterly winter winds off the Asian continent bring regular, heavy snows that make this one of the snowiest regions on earth. In Niigata Prefecture, for example, annual snowfalls of 4 to 5 meters (13 to 16 feet) are not unusual. All areas except the northern-most island of Hokkaido have a hot and very humid rainy season (called Tsuyu) that lasts from early June to mid-July. And between August and October, the southwestern part of the archipelago is often hit by typhoons. The inland regions of Honshu and Hokkaido, particularly the basins in these areas, receive little rain and are subject to large temperature variations. On the other hand, the coastal regions of the Inland Sea lying between the islands of Honshu and Shikoku, though also quite dry except during the rainy season, have a moderate climate. In almost all parts of Japan the best seasons are spring and autumn. The countryside is especially beautiful during April and May when all is freshly green, and between late September and mid-November when the air is refreshing and the leaves have changed color. You have to carefully choose where you are going and what you are going to do, according to the seasons. 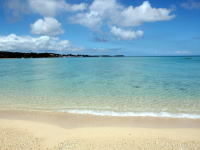 Also keep in mind that during the peak holiday seasons, especially Golden Week (late April to early May) and Obon (mid-August), there will often be considerable difficulty in getting reservations and many places are quite crowded, as domestic travel is extremely popular. Without a doubt, you shouldn't travel in Japan during Osyogatsu (January 1st to 3rd) as almost everything in Japan shuts down.